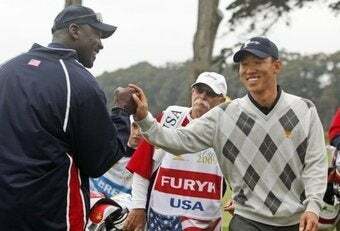 Staying Out Late, Sweating Make Anthony Kim A "Loose Cannon"
Anthony Kim was a key player in the U.S.'s President's Cup win this weekend, despite the fact that he didn't sleep much and doesn't really want to hang with Jim Fuyrk. The man is out of control! Robert Allenby of Australia told reporters that his friends spotted Kim returning to the team hotel "sideways" at four in the morning on Sunday, just hours before his 9:00 a.m. tee time—against Robert Allenby. Of course, Kim went out and crushed Allenby 5 and 3 to help cinch the Cup, which just left his opponent even more perturbed. "I'm just pissed off that I lost to him," Allenby said. "Maybe I should have gone out with him ... Maybe we should all take the theory of Anthony Kim. Get home at 4 o'clock (in the morning) and then go shoot 6 under." Allenby went on to say that Kim is "the loosest cannon in that team," which is a bit like saying that Donny was the craziest Osmond brother. But according to GolfWeek, team captain Fred Couples allegedly asked Kim to leave a team dinner earlier in the week, because Kim needed to make himself "more presentable." (Kim says he was "sweating" and did not feel well.) Couples wrote it off as a 24-year-old kid who doesn't want to hang out with a bunch of old farts (probably true! ), but he also took some sage advice from noted Mormon scholar Michael Jordan. Hey, Michael Jordan partied with Dennis Rodman. (And also with Michael Jordan.) The man knows his loose cannons.